If you speak three languages, you’re trilingual. If you speak two languages, you’re bilingual. If you speak one language, you’re American! Why is it that we require everyone to study language in school, but very few people actually have anything to show for it at the end? It seems we are teaching language, but few are learning it. Ireland, like Canada, has two official languages: English and Irish Gaelic. All signs are written in both languages, there is an Irish-language TV station, Irish radio, and Irish is taught in school. 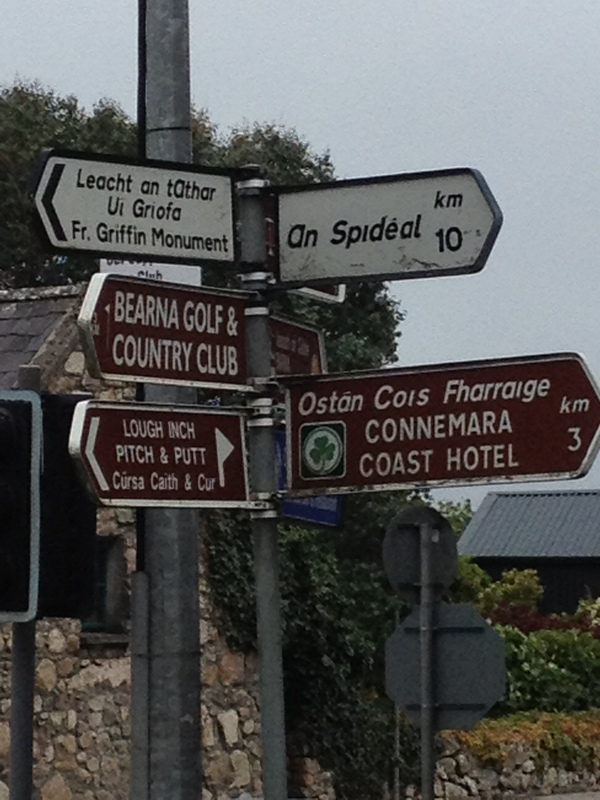 There are even areas of the country, known as the gaeltacht, where the primary day-to-day language is still Irish. An Irish speaker wearing a Fáinne: a pin badge worn to show fluency in, or a willingness to speak, the Irish Language. I think we should take note of this in the States: if we really want to cultivate a country full of multi-lingual citizens, we need to start teaching foreign languages earlier. What do you think we should do to encourage better language learning in the US? Working in the schools, I know that teaching a second language early on is not a priority in most schools. I think the exceptions to this are schools that attract higher socio-economic populations (often times parents who themselves have higher than average education levels.) I wish it were different, but I also know that, in the big-picture-education-needs conversation…this topic is not even really near the table. Of course it might be different in other states?? I certainly envy your multi language ability–knowing Spanish would be a dream come true in my profession! I agree: I think the priority in many American schools is assuring literacy in a kid’s first language (!) and that second language fluency is seen as a “perk” to be developed later. I don’t really have any idea how to fix this since it speaks to the state of education as a whole, but it just interested me to see that other places somehow manage to do both.